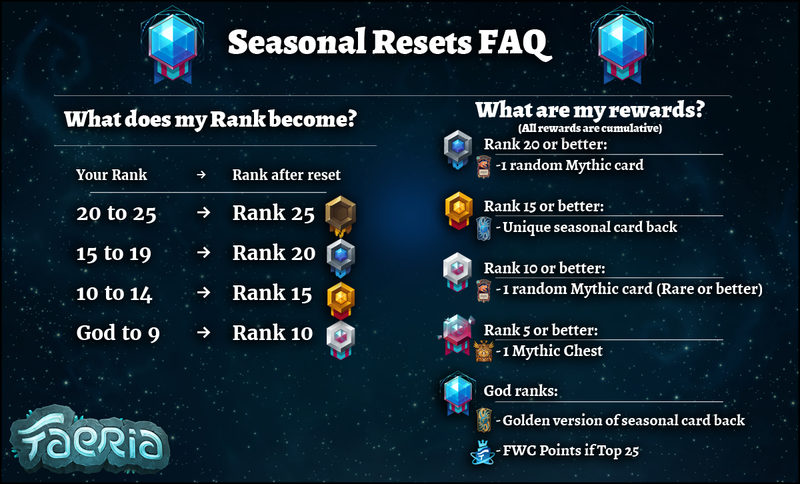 New animations are coming, season reset is this Monday, and Kickstarter upgrade update. Plus more! It's not just any Friday, it's Faeria Friday. But so will be next Friday. Anyway bye. We're not just slapping in new cards with the Fall of Everlife expansion, we're putting some love into them. Here is an example of one of the new animations we've been working on for the new card, Rain of Fish. We present it with no sound so you may focus on its wonder and beauty. Click the image above to see the animation. The biggest news this week, of course, is the Loyalty Patch we applied earlier this week. Make sure to log in and complete the four brand new puzzles for the exclusive Loyalty Orb, or receive the free Legendaries if you do not already have them! The current season resets on Monday, June 4th at 12:00 Noon CEST. We recognize at this time that a lot of the latest Faeria content does not yet have proper localization complete for other languages. We are currently working on a new internal tool that will make adding and updating translations even easier in the future, and plan to fix these discrepancies as we roll out the new content this Summer. Supporting other languages is important to us and we plan to continue doing this for the future. Thank you for your patience! It's important to us that we keep our players informed of the upcoming content and B2P transition this summer as much as possible. We know not every player reads our blog posts, and even less will read every single one - so some things bear repeating. You'll notice this link in-game as well, but it should contain all you need to know about the changes you can expect coming this Summer. One point in particular we want to address, to be absolutely clear: You will need to purchase the Fall of Everlife DLC in order to gain access to its new cards. We will be revealing the exact release date and prices for the expansion soon - these questions we are not quite ready to answer yet to ensure we provide the correct information. "Will original Kickstarter backer contributions count toward Deluxe Account upgrades? We have decided that yes, all Kickstarter backers, no matter the contribution amount, will receive a free Deluxe Account upgrade. We are very grateful to those who helped Faeria become a reality and don't want to leave anyone out. However, due to how Kickstarter tracks backers and our separate account system, this process will not be automatic. If you do not receive an automatic upgrade, you will need to contact us on an individual basis. We will simply verify your contribution and manually upgrade your account as necessary. We apologize for this extra step, but there's no other technical way to achieve this. Once the transition to B2P happens, we will ask you to email support@abrakam.com with your request and we will process it as soon as we can. Please do not make any requests until the B2P transition happens, as your account may upgrade anyway! Our $400 Championship League tournament dates are set for June. Register now for a piece of the pie and some FWC points! Everyone loves a good tierlist. 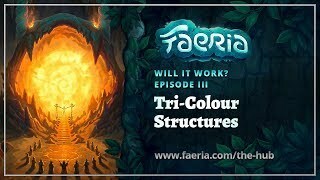 One of the best competitive players in Faeria, xged, has put his thoughts together and created the following guide. Do you agree or disagree? He'll probably beat you anyway. Click below to see the entire list. Aquablad's experimental series continues with its third episode. Can a tri-color structure deck work? Watch the meta completely shatter. Matrien's Midnight Memes - Warning, use at your own risk.